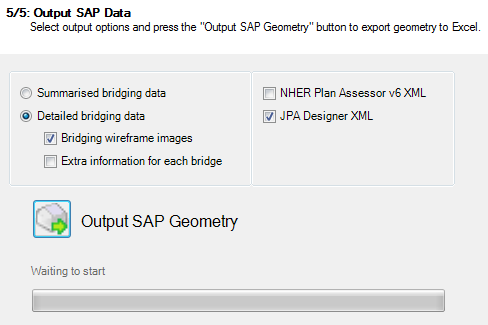 The TBD SAP geometry tool now has the option to export data in the JPA Designer XML format. The SAP geometry tool uses the data from the TBD file to calculate surface areas and thermal bridges according to SAP 2012 guidelines. Geometry and heat loss data is exported to Excel (with an option to include images showing thermal bridge locations). The tool can export data in XML formats suitable for JPA Designer or NHER Plan Assessor. In 2017, CIBSE released a new technical memorandum, TM59, which provides a method of assessing overheating in homes. While other overheating criteria exist, i.e. TM52 for non-domestic buildings, TM59 differs from the rest by requiring more work from the assessor to complete the assessment. To help speed up the process of carrying out a TM59 assessment, Tas has introduced a TM59 wizard in V9.4.2. The first feature of the TM59 wizard is the ability to create the internal conditions for a TM59 assessment. The TM59 guide dictates the internal gains to be used during the assessment for most room types. 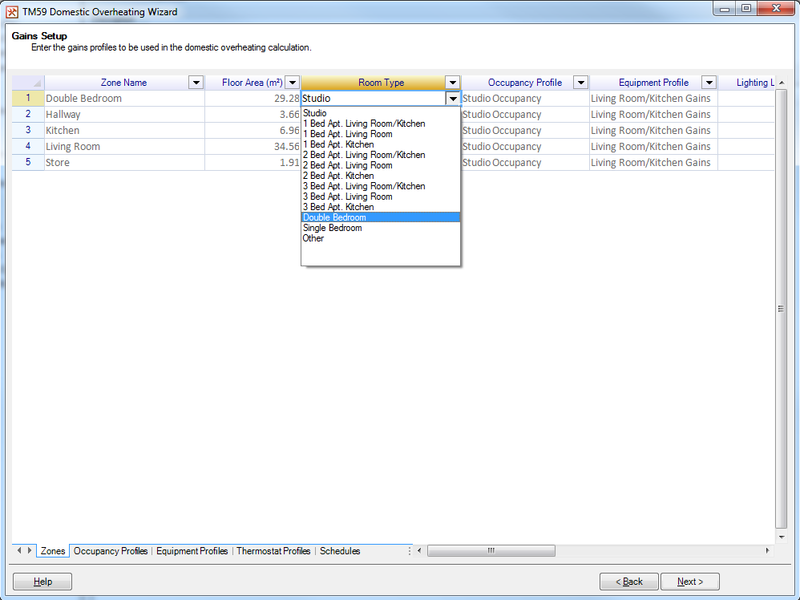 Due to this, the wizard allows you to assign the gains to the spaces by setting the room type. A Screenshot of the Gains Setup page, showing the Room Type being set for a double bedroom. For most assessments, the gains specified in the TM59 guide must be used, but there are cases when some freedom is allowed and the wizard supports this via custom values. The second feature of the TM59 Wizard is the ability to make multiple scenarios and run them simultaneously. This is useful as while the minimum that needs to be done to pass a TM59 assessment is to pass all criteria while using a CIBSE DSY1 2020, high emissions, 50% percentile scenario weather file; TM59 strongly recommends the assessments to be run with multiple different future weather files, however these assessments do not need to pass. 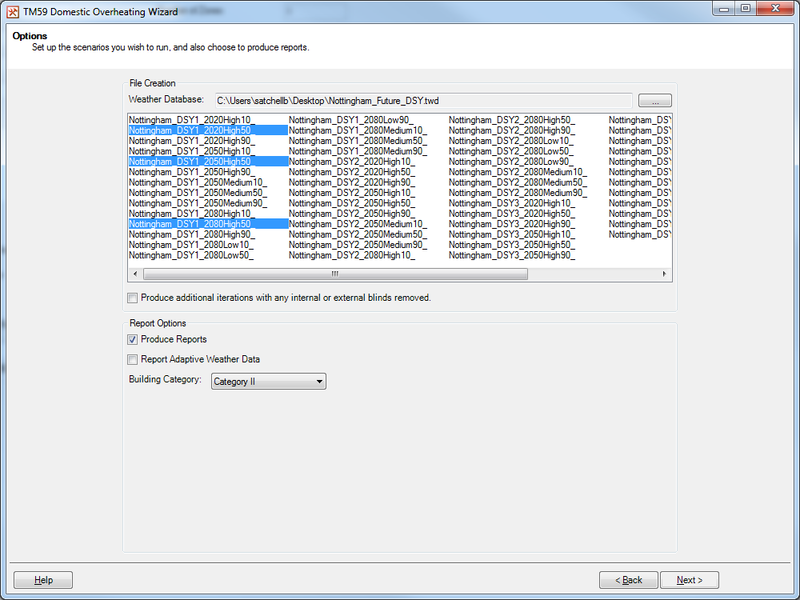 To help aid the creation and simulation of multiple different scenarios, the wizard allows the creation of multiple scenarios using different weather data, or with any blinds included in the model removed. Not only are these scenarios created by the wizard, they will also be simulated automatically by the wizard after creation. A screenshot of the Options page, where multiple weather files selected. For Living Rooms, Kitchens and Bedrooms – These spaces must meet Criterion 1 of TM52, i.e. the number of hours where ΔT is greater than or equal to 1K during the summer period cannot be more than 3% of the summer occupied hours. For Bedrooms only – The operative temperature cannot exceed 26 °C between the hours of 10pm and 7am for no more than 32 hours. Occupied rooms should not exceed an operative temperature of 26 °C for no more than 3% of the annual occupied hours. For each simulated scenario, a report will be generated detailing if the spaces in the model have passed or failed. These reports can be exported to PDF, Excel or Word at a click of a button. 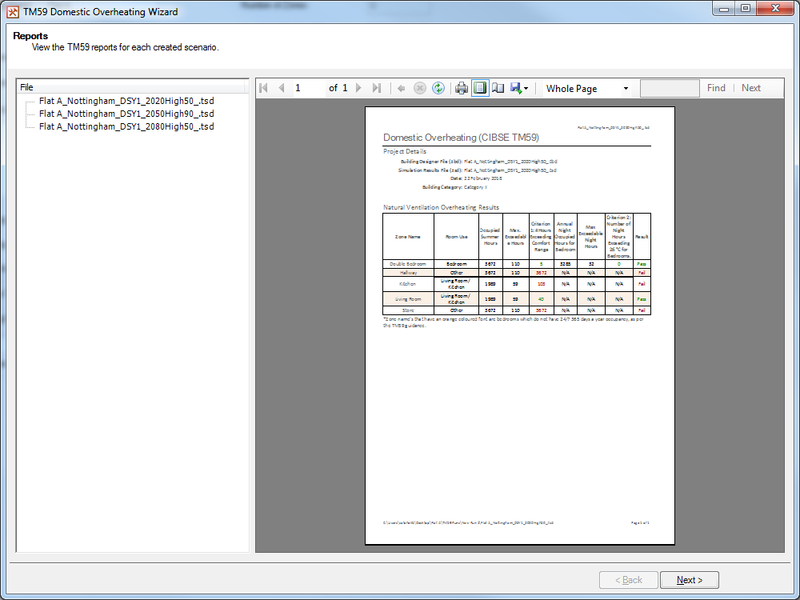 A screenshot of the Reports page, showing the report produced by the wizard. If you are interested, more information about TM59 including how to purchase the guide can be found here. In the latest version of Tas (v9.4.2) the software’s capability to import and export IDF files has expanded again. Exported IDF files will now include an IdealLoadsAirSystem object for each zone, allowing immediate simulation of room loads in EnergyPlus. EPW weather data can also be imported. This capability allows cooperation on projects between Tas and EnergyPlus users, and provides a way for EnergyPlus users to become familiar with Tas using one of their existing projects.